Katherine DeLuca began with her presentation titled “Rhetorical Technofeminist Pedagogical Approaches in a Graduate Professional Writing & Communications Course.” After reading Clinnin and Katie Manthey’s forthcoming work on rhetorical technofeminist pedagogy, DeLuca decided to engage with these practices of embodiment and critical engagement with technology in her graduate level document design course. As she had not previously taught this course, DeLuca was set with the challenge of learning the subject alongside her students. Given this challenge, she “embraced [her]vulnerable position as the instructor” and found her embodied approach central. DeLuca was transparent when she was unsure about questions that came up in class and practiced this by doing homework and projects that she was not yet an expert in. DeLuca was using a colleague’s course material and found herself asking critical questions about the kinds of instructional videos and educational materials we value for technological and digital based coursework. Calling herself and the audience to consider questions like: What identities are not represented? Who do we value as an expert? Nearing the end of her presentation, DeLuca helped us understand that addressing rhetorical technofeminism at the beginning of a graduate course as a key framework, practice, and value in the seminar is a change she’d like to see through in the future. This presentation built solidarity for new instructors or those new to courses by encouraging embodied transparency and critical interrogation of the kinds of representation found in pedagogical materials. DeLucas demonstrated a helpful example we should all consider about learning alongside our students. In the next presentation, Katie Manthey reflected on her experiences teaching an advanced undergraduate course titled “Fat Feminisms: The History of the Body Positivity Movement.” This was a women studies special topics course designed to be writing-intensive. Manthey stressed the interdisciplinarity of this course design– expanding the possibilities for applying a rhetorical technofeminist framework beyond English courses. With the goals of critically engaging with the body positivity movement and feminist theory and practices, Manthey says the class used different theoretical texts and composed on platforms like Pinterest, Tumblr, and Instagram accounts. Composing in these spaces were meant to help students understand the modes of technology associated with the body positivity movement and critically engage with embodied identity and performance in these spaces. Manthey discussed the oftentimes difficult questions we might imagine in courses of this topic, but expressed her dedication to teaching philosophies of “performativity, transparency, and embodiment”–finding this course a ripe situation for enacting these using rhetorical technofeminism. Manthey’s discussion left us thinking about how an interdisciplinary course like this might be translated to a different context. She offered rich possibilities for enacting rhetorical technofeminism in a highly relevant, theme-based course that uses technology and social issues as points of interrogation. Not only do students learn about issues surrounding the body positivity movement, but are challenged to critically engage with digital composing technologies, representation online, and embodied experiences. This course demonstrates praxis and activist focused course design that enables students to understand intersectional experiences in the body positivity movement. Manthey left me inspired with her courageous dedication and change-focused work–opening the possibilities of special topic courses grounded in rhetorical technofeminism. 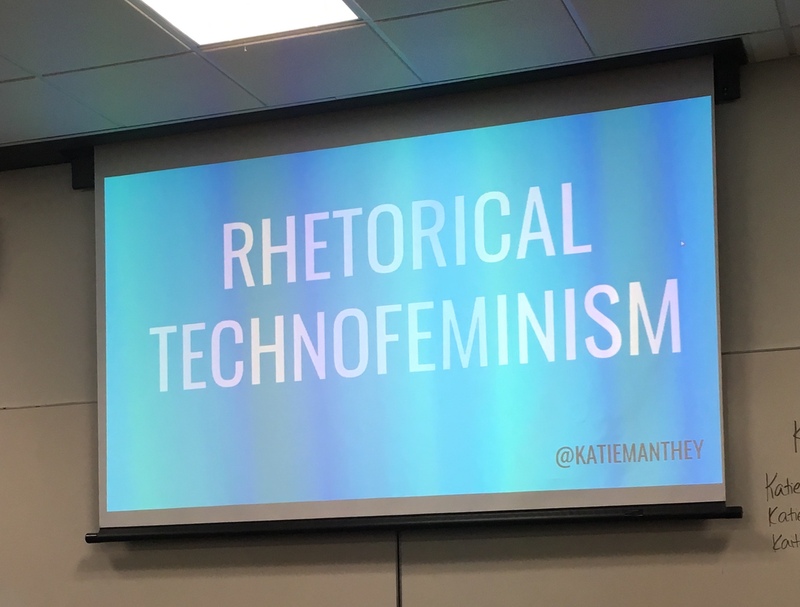 In the final presentation, “Rhetorical Technofeminism in the First-Year Writing Class” Clinnin discussed her own program and the benefits of using rhetorical technofeminism in a first-year writing class. As a composition director, she reflected on programmatic shifts that help encourage instructors and students engage in these theoretical and activist practices. She rightly noted her “superpower” as the ability to build her first year writing classroom with these approaches in hopes of demonstrating the possibilities of public, activist focused analysis and writing in the composition classroom. Clinnin sees rhetorical technofeminism as a productive method to meet learning outcomes and institutional expectations in first year composition so that students can critically address these “thorny techno-social” problems like online harassment and trolling. However, she rightly notes the push backs and difficulties in developing these practices depending on the values of the department that many in the audience might face. Clinnin certainly demonstrated the importance of engaging with social justice focused goals for instructors and writing program administrators. Presenters used much of the end part of the session for collaborative work shopping. Members attending the panel broke into two groups to discuss experiences and questions they had about rhetorical technofeminism in praxis and ways they might enact these in their own institutional settings. In one group, members discussed the affordances and drawbacks to the explicit mentioning of rhetorical technofeminism or feminism writ large in the classroom. Conversations turned to the idea of more implicitly designing activities, readings, and assignments with goals of critical engagement with rhetorical technofeminist tenets without overwhelming first year composition students with theoretical terminology. The other group shared conversations about negative course evaluations as a roadblock or repercussion to building these practices into certain courses. This led to more experienced instructors reflecting on the oftentimes sexist results of course evaluations and how some departments hold them at a higher weight than others. This left me thinking about how my own identity, and more importantly, women of color might be affected by the ways they design their courses and how that could have real consequences for the instructor in certain circumstances. This was an exceptional panel that inspired new and seasoned instructors alike to consider implementing rhetorical technofeminism in ways that counter oppressive structures and harmful interactions created by technology and systems of power. Rather than a one-size-fits all approach, this session was interdisciplinary, flexible, and accessible for any instructor. The knowledge shared can be used to encourage students to critically engage in new ways that will fulfill and excite learning outcomes in writing-focused courses from the freshman to graduate level. As a new instructor and graduate student, I left this panel inspired by the presenter’s commitments to social change, deep engagement with intersectional feminist theories, and exciting opportunities to ground my own courses in rhetorical technofeminism. Maryana Boatenreiter is a MA student in Composition and Rhetoric at Miami University. Her research interests are anti-racist and feminist pedagogy and the intersections of place-based and digital activism.